Wool, wood, wire 29" x 19" x 11"
Wood, paper, photo, metal, found objects 14 x 14 x 2.5 The story of Amy Johnson, British aviator. A room, used as a refuge, by whom? from whom? Plaster, paint, paper, found objects. Influenced by Surrealism. 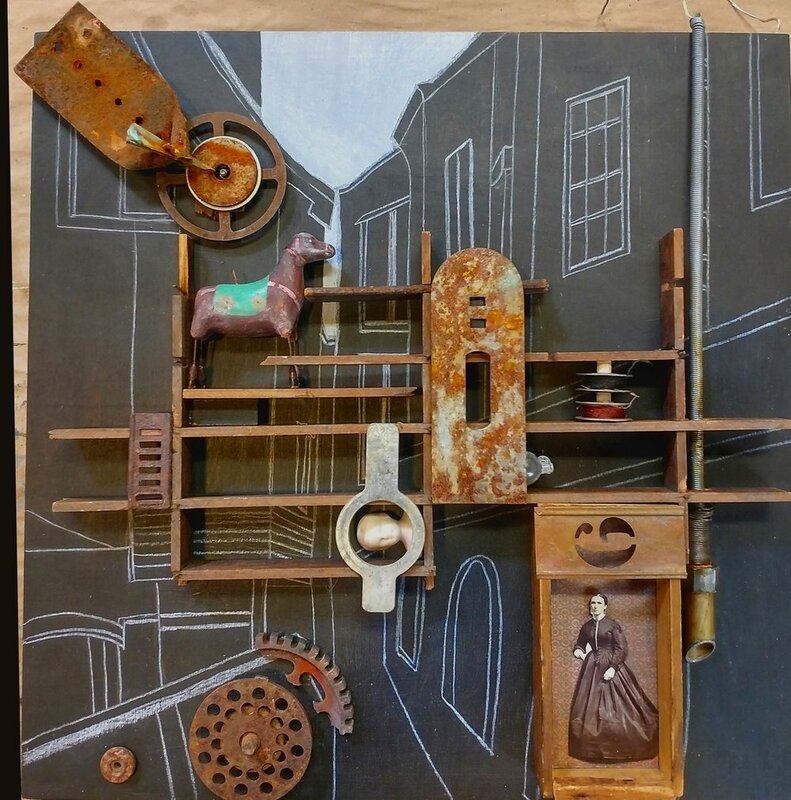 46" x 11" x 9"
Old organ wood and push buttons, collage skeleton diagrams, and found objects. 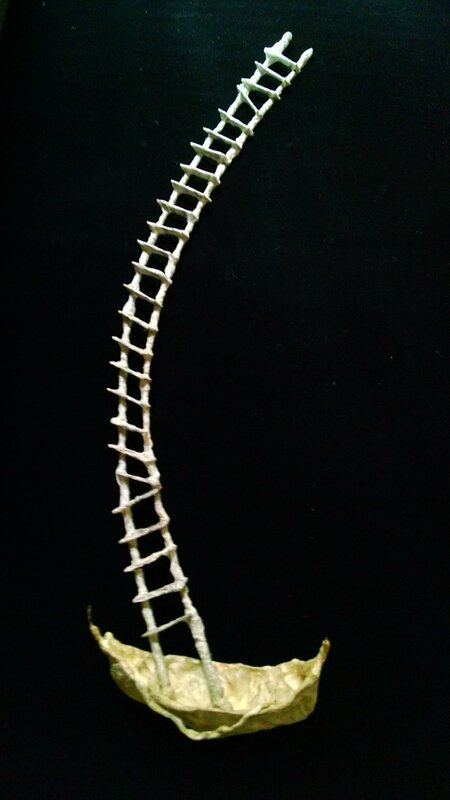 This piece has several hidden features that can't be seen in this photo. Contact me for more photos. Wire and paper mask on wood base Based on the famous sculpture, this version is very light because it is hollow. Plaster carved painting with found objects. Where is your dark place? Ellis, 1924 (mugshot series) 125. Found mugshot of one cool dude in the 20s. 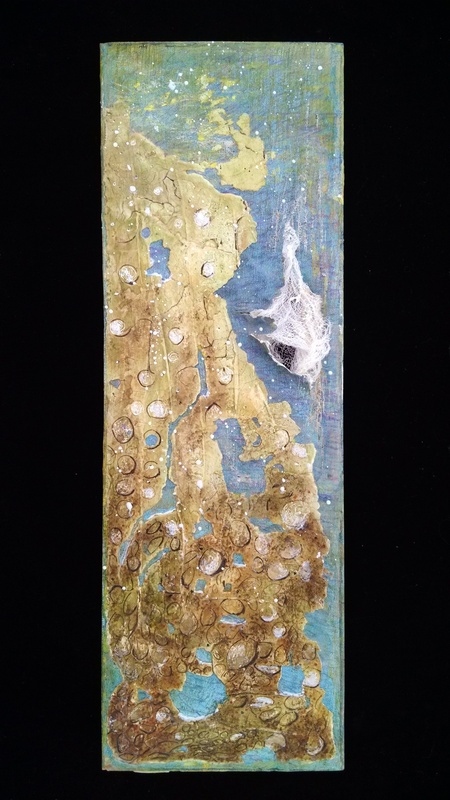 Wood, paper, encaustic wax, string 14" x 5" 3"
A piece that reflects what you see within it. And what do you make of those three tiny flies seen flittering around? Plaster, paint, paper, and encaustic wax on a deep wall panel. A collage dressing a lady of the 19th century in ads from a woman's magazine of her era. The background made from newspaper want ads of the 20th century and a beautiful verdigris piece of copper attached to a deep wood wall panel. 11" x 10" x 1.5"
Winter memories of snow, trees and forest animals. Collaborative piece with artist Ken Berman. Transparent, found object piece. Hang on the wall for an ethereal abstract that looks as if a hornet has created it, hang in light to transform it and show all the circular details. Found objects, tissue paper, glue, wood frame. 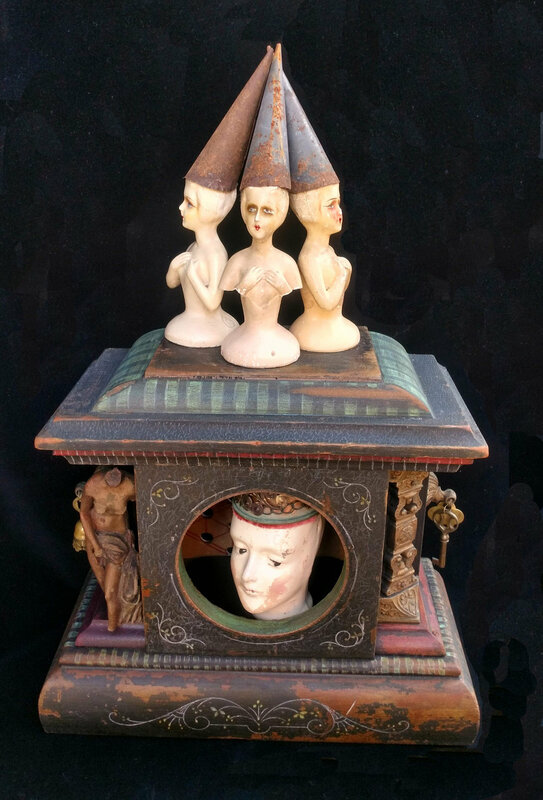 Commissioned piece made from purchaser's found box and family memorabilia. Contact Cat to create a personal family memory for you. kaufmancat@gmail.com. Pricing varies by scale. 15" x 14" x 1.5"
10" x 8" x 1.5". Where will life take her? Plaster, paint, images, encaustic wax. Plaster on wood panel with paint and found objects. A class of boys graduating from a private high school. They had no idea that their future included a world war. I've tried to capture their hopefulness while foretelling their future in this piece. Found photos from the Phillips Exeter high school class of 1937. On painted board with encaustic wax. Childhood is fleeting and as ethereal as the wispy pieces of netting that make up this piece. If you look carefully, this cute little bird carries the memory of the baby blue lined paper we all used in school when learning our alphabet. Do you ever feel that you are the prisoner of your circumstances? This wire, paper and string assemblage on a piece of chair shares that feeling that you can get tied to your own life. But you can choose to change that as well. Supplicant Definition: Someone who asks with earnest prayer. Who is doing the asking? Who is hearing the prayer? Remembering the great magician in his habitat. 13" x 11.5" x 3"
All metal. Would make a great hanging garden sculpture. Assemblage. Just plug in the head and you are ready to go onstage! The story of the Dalai Lama is fascinating. When one dies they search for the reincarnated soul in a toddler. He is taken to live and learn with the monks - so is he born to lead or taught to lead? Violin case containing layers of paper with an old map of Antarctica below. The layers of paper reflect the glacial layers and the piece feels as though it was just found buried in the ice - a remnant of a long ago shipwreck. 52" x 33" x 4" 2012 Assemblage. 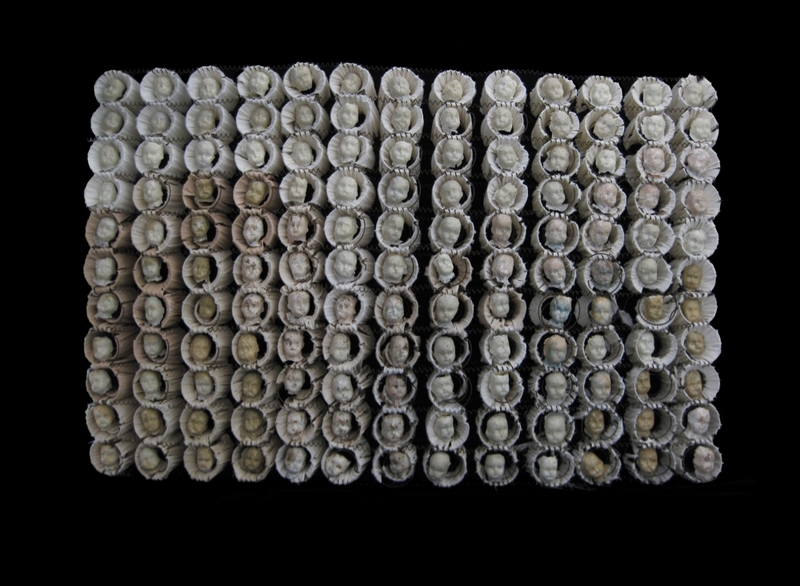 Using a found rusty wire coil baby mattress as the base, I hand tied strips of linen, some tea stained, around each coil and within each is a small baby mask made from wire and paper. Looking closely at the faces you will notice that each has its own personality and is in its own little nest of linen, some more cushy than others. Meaning resides in the concept that every person is born into different circumstances in life, some more loving and comforting than others - fate plays a role in our start in life, the rest is up to us. 36" x 14" x 3"
both are wrapped, as if in a dream. 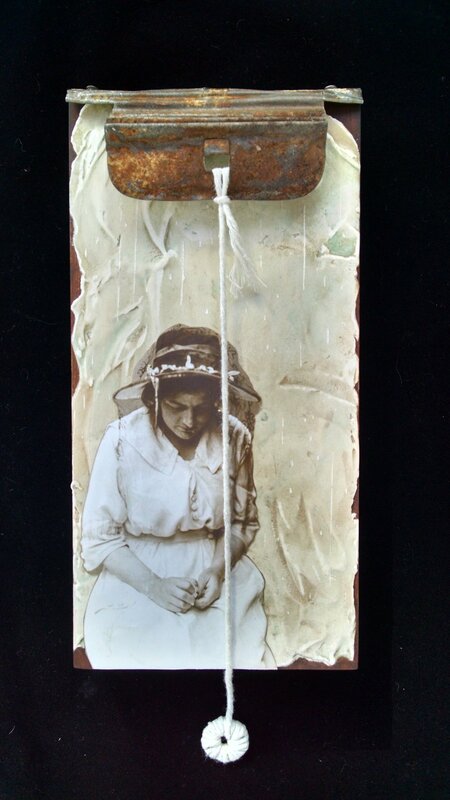 Plaster encaustic with photo, wire, rusty metal, wood, paint. I took this photo of the dead bird and its shadow. White represents death in many societies as it does here. The rusty piece of twisted metal that protrudes from the piece creates a marvelous wing-like shadow on the wall when light is directed at it on the wall. Wire and paper hollow mask with a lot of personality. 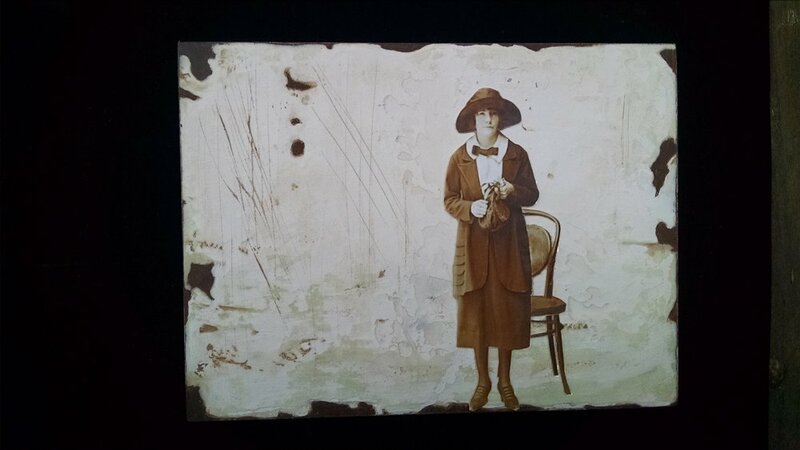 22.5" x 10" x 2.5"
Plaster encaustic assemblage created in reverence to Adele by Gustov Klimt. The brown river flows from left to right across the piece, passing objects representing the history of the painting, from its creation, into war years, where it was stolen by the Nazis. Parts of the piece reflect symbols and colors in the Klimt painting. Found pieces reflect their own histories and create a new one now that they are combined. A woman from an earlier era reflects on modern issues while her eggs accumulate at her feet. 11" x 12" x 2.5"
10" x 8" x 3.5". 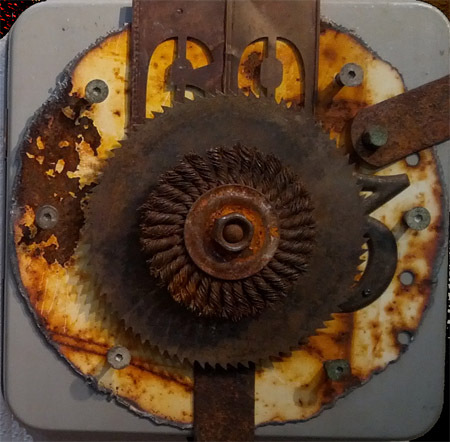 Shown at an angle to see that the found metal circle protrudes from the piece. 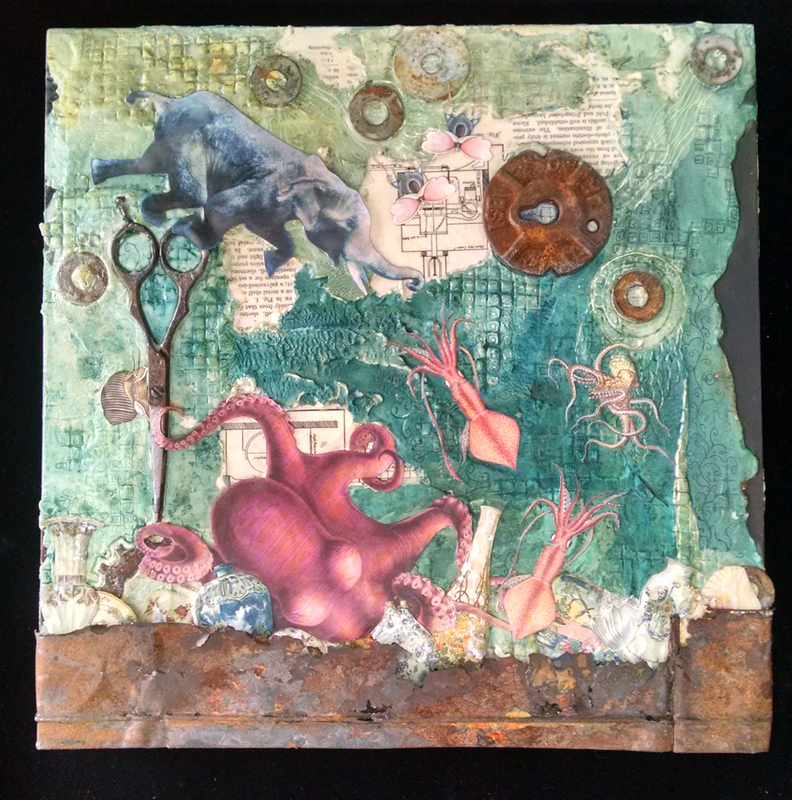 Plaster, paint, encaustic wax, found objects. Commissioned mask. Wire, Paper, cloth, paint, plaster. 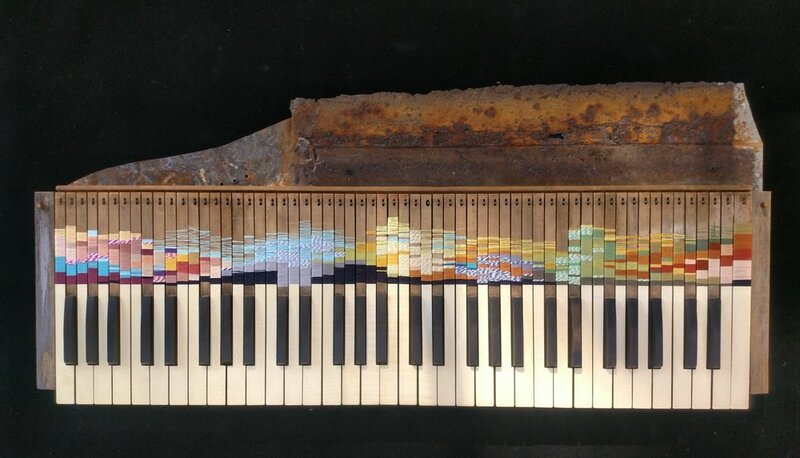 Assemblage with painted canvas backing and wood ruler, rusty pieces from beach on Kauai, Hawaii. Framed in metal with white feathers, image of woman and ceramic doll legs. Wire and paper mask with paint on found metal. The pull of love or infatuation struggles through all barriers. This piece has a black wood frame that holds a large wood and metal pulley, rusty chain with stirrup. 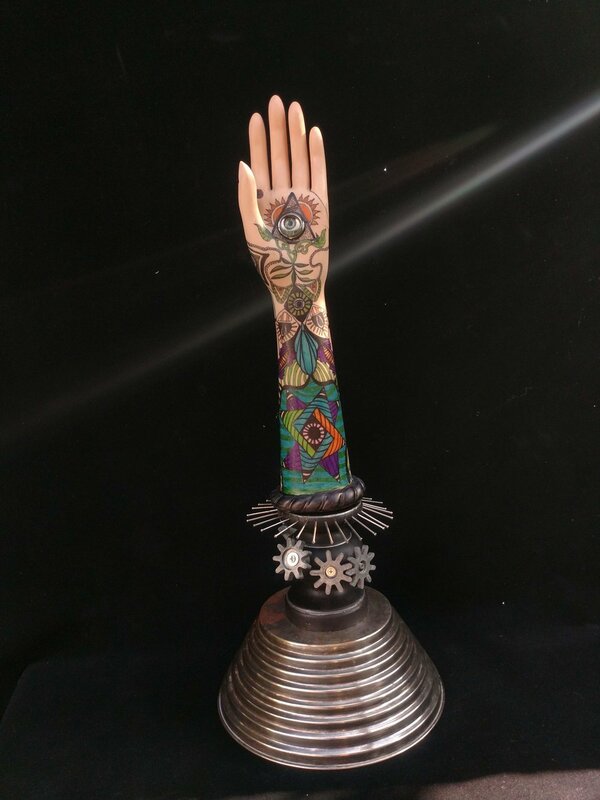 A metal framework and railroad spike suspends a mannikin hand as it reaches toward another hand at the bottom of the piece. 8.5 x 8 x 2" 95. Found objects in silverware box with plaster buddha. 6" x 26.5" x 7"
Based on the story of Phineas Gage, the man who was injured by a spike through his head when it was dynamited in the 1800s. He is famous as a study for the area of psychology. Represents the societal confinement of women in past centuries. Wood, paper, wax, found objects Filled with things that are worshiped: money children, gods, etc. Found Objects Representing the young vaudevillian actress who was killed in the 1906 earthquake in Santa Rosa, CA.